Who are we asking? | Precious Thoughts! One thing is certain-I miss blogging a lot. It is only a matter of time before this phase [dissertation phase] will be over. I hope I’m forgiven? Also I want to thank those that checked on me to find out why there’s been no post lately and those who kept checking relentlessly for new posts. I really appreciate the gestures! I have a lil’ something to share today……. Today I am owning up to the fact that I’ve ask Google more questions than I’ve asked any human being and God. Oh yeah! Here’s what I typed: ‘why did I cut myself severally today?’ and you know the rest…there was no satisfying answer,of course. And then, I realised how we, humans, seek answers from the wrong places, people, even things. I am not saying that I was meant to ask God: Baba, why all these cuts today nah?? that’s just a prelude. Hopefully, I won’t be asking Google any more silly questions. 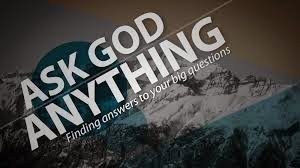 My point is: let us return to asking God all the unanswered questions in our hearts, He has the perfect answers. No man, thing(Siri) or search engine (Google) can give you accurate answers where your future, present and past is concerned. This is deep PRADAKE, thanks alot. Awww it's nice to grace your presence here Sydney. You're welcome. To God be the glory! You are absolutely correct. I am a Subscriber to this wonderful thought. Kudos dear!